Beautiful tablescapes are one of my first loves and holidays are the best excuse for dressing up your table. I am particularly fond of Easter and always love celebrating holidays (and even the every day!) intentionally and thoughtfully. 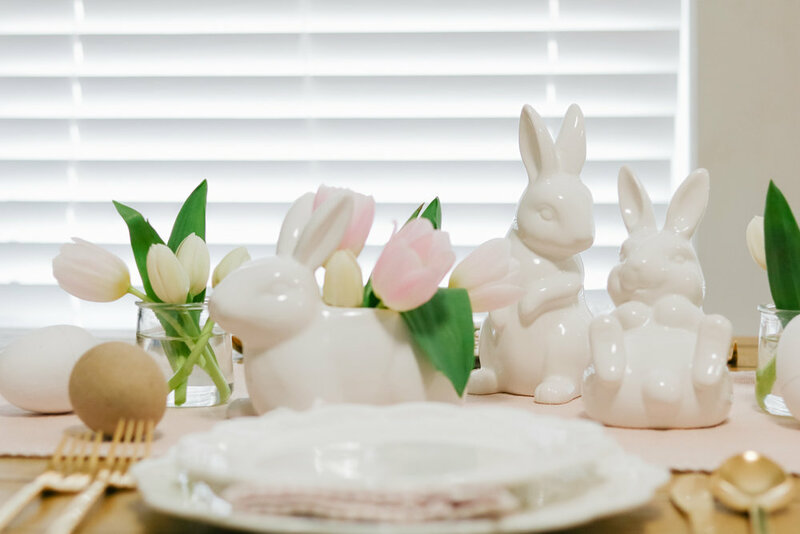 I love the soft colors, fresh blooms, sweet bunnies and the feeling of new that comes this time of year and now that we are home from Disney (so much more on that coming!) I am finally getting our place spring ready. Olivia of course can’t wait to get her kitchen decor finished, which should be in the next day or two- so I’ll be sure to share that soon too. In the meantime, I wanted to share this really easy and affordable tablescape idea. 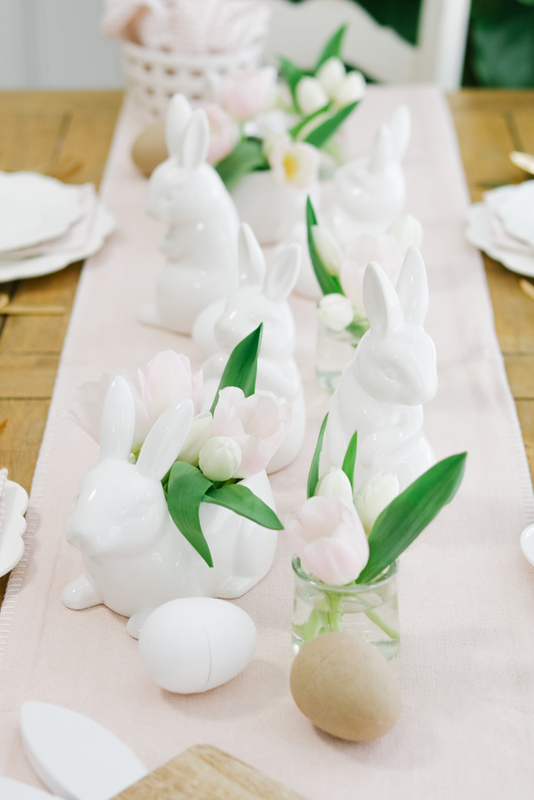 It’s perfect for Easter entertaining or any other spring hostessing you may be doing. Tulips are quintessential Easter and they are a steal at $4.99/bunch at Trader Joe’s. They don’t always last the longest but the price can’t be beat. Grab a couple bunches and for $10 your table will already look gorgeous. Blush and white are my favorite for spring. Now, for the bunnies. Does anyone else get bunny fever this time of year? I just can’t get enough! If you’re like me, run to your Target store! The white ceramic bunnies are from the dollar bins! The figurines and the candy dishes are only $3 each. They had two styles of each, and as you can see I opted to use the candy dishes as vases instead. I adore them. Don’t worry— if you can’t make it in or if your store is sold out, I’ve found a few other great options that I’ve linked below. The blush striped napkins are my current home obsession. 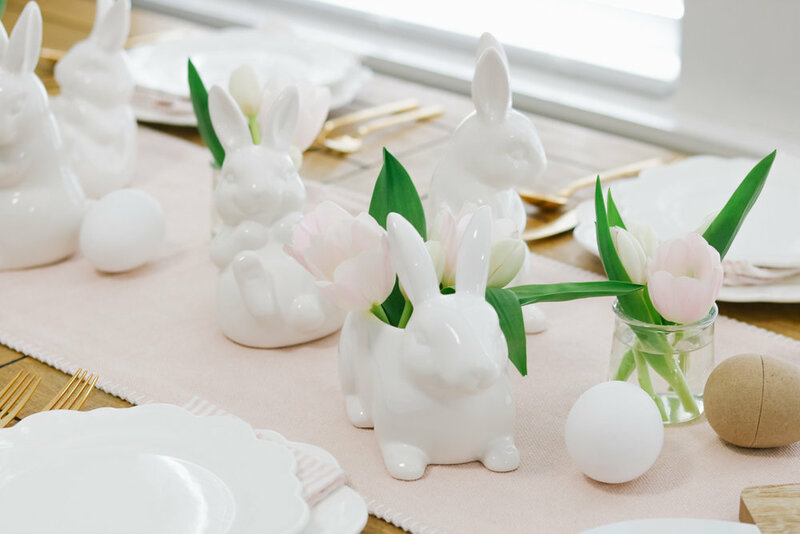 I had been eyeing these from Pottery Barn since last Easter and right when I was about to finally cave, I found a pack at Homegoods that is almost an identical dupe. Only $6.99/ 4 pack! I texted my decor savvy aunt to please keep her eyes peeled for another pack at her store and as luck would have it she found another one for me! I think they are so lovely for this time of year and with the price tag, they are more of a practical buy for fabric napkins with a little one at home. My aunt also surprised me with this beautiful blush linen runner which so perfectly ties everything all together. I love the color and texture a runner can add to your table and it isn’t as guaranteed to get crazy messy with littles at the table. 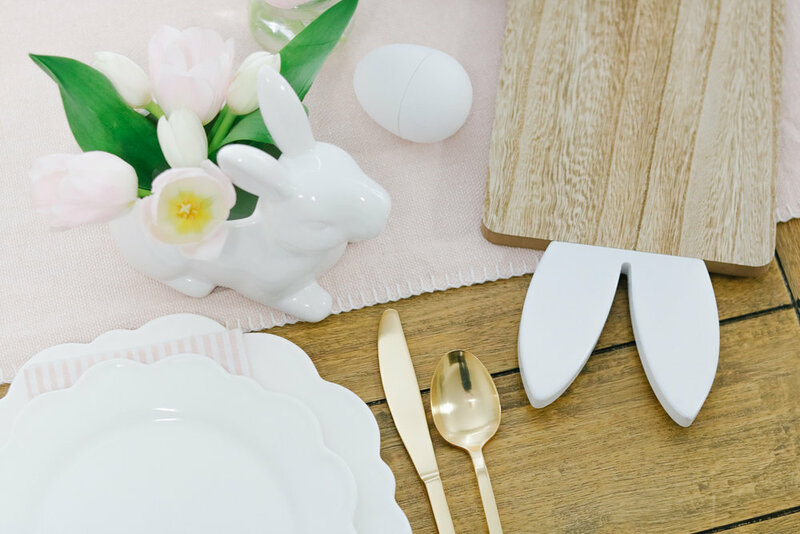 If you’ve got kiddos joining you, I love the idea of Easter Eggs on the table filled with little treats or a small activity (crayons, stickers.etc.) to help entertain them. These eggs are perfect for that. They can even be decorated by the kids which is another fun activity.. You can also take it a step farther and personalize an egg stuffed with goodies as a place card at each seat. Our Easter breakfast will be casual so I skipped that, but it’s a fun idea if you want to do a little more. Every year we make bunny pancakes for breakfast after our Easter egg hunt and Easter basket fun. I love sitting down to a thoughtfully decorated table and hope the special touches we put into our home are something Olivia carries with her as she gets older. As you can see, a little can go a long way and it doesn’t have to be super expensive or complicated to feel exceptional.